Hello everyone I come to tell you my problem that appears and one of the many having read all the comments. 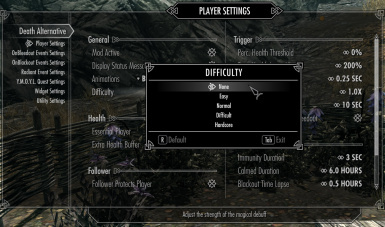 I am one of the people who can not remove the "Critical Injury" effect I saw that there are commands to remove active effects, you just have to have the CriticalInjury ID. Like that, I can manually remove the problem. Can you please indicate me how to get it ? and if you have a clue what is the ID ? 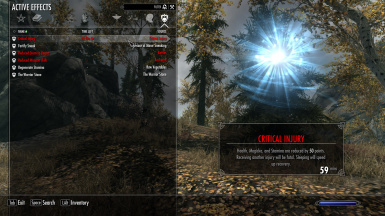 I have problem with this mod, the "Critical Injury" debuff wont go away. The timer counter didn't even go down below 59. So here's the story : I got knocked down, my follower then follows. We're blackout and respawned somewhere (in friendly area), I received 3 debuffs + "Critical Injury". So I get my tent out (Campfire mod) and rest for 12 hour. When I wake up, all those debuffs still not gone. Tried to wait 1 hour in REAL LIFE, didn't work either. 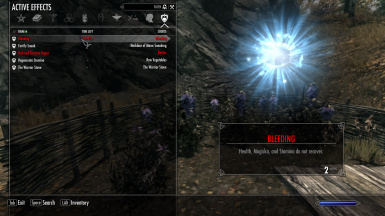 I eat Garlic Bread, curing 3 debuffs but the "Critical Injury" still persist. 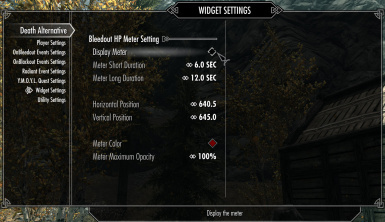 All MCM settings is default - didn't even touching Death Alternative settings at all. Maybe there's something that makes it glitchy, but the Death Alternative itself seems working fine. No error on starting New Game. Tried with New Game, "Critical Injury" didn't disappeared too. Dunno if there's conflicting mod with mine, but I'll pass this one off. Great mod and is a different flavor to what DA has to offer. 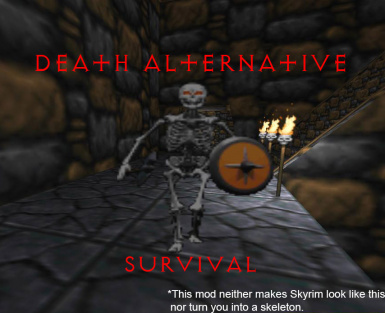 I've installed this along with dead is dead, which is supposed to work with DA but I found out that dead is dead and this mod will not work well together. What happens is that dead is dead will trigger immediately after being knocked out and will not wait for this mod scripts to run.However, if I only use vanilla DA and dead is dead, things workout fine. I hope the author will consider fixing this as the trio will be amazing with each other. Niklass I'm never recovering my critical injuries even when i'm rested / well rested. I use realistic needs and diseases. I also already cured my disease before I slept. I'm using your RND version also. If you could help me out i'd be grateful. Thank you. As soon as I clicked stop RND in the MCM menu and went to sleep the wound healed. So even though I have your RND version there is still something going on here. Are you loading DA-Survival after RND? Yes I am. It's near the bottom of my loadlist. Love the mod! Any chance of an MCM and an option to change the percentage chance of getting a disease when being knocked down? I use the mod Diseased, and curing diseases are way harder then before, not to mention diseases with that mod are serious and can be fatal. A simple option to change the overall percentage would be good, though a selection of options to set it differently based on whether the attacker was a bandit, bear, undead, etc would be awesome. Or an overall percentage, with those other selections being modifiers. Oh yeah... I better stop before this post gets a mile long. How did it work with DAYMOL Captured ? what about the load order ? Sorry for only answering now. I don't understand how the new notification system works, I thought I set it to display comments but apparently it didn't. It's compatible with DAYMOL captured. Load order doesn't matter. I use it myself, too. thanks for your wonderful mod! but the critical injury effect refuses to go away. tried to rest, tried potions... nothing will do. I can't really be of help because I can't replicate this problem. I just tested it again with the latest version of DAYMOL and it works. The original poster was using the Needs and Diseases version which is tricky when it comes to getting rid of the debuff. The description was a bit vague about how you get the rested buff which my mod checks but what I found out was that you needed to sleep for a sufficient number of hours and that you needed to remove the diseases prior to sleeping when using Realistic Needs & Diseases.